DFT’s LSV-100® Control Valve is a highly economical valve that is designed to meet the needs of any flanged application. This valve provides standard Class IV shutoff and is utilized for modulating control of demanding liquid, gas, and steam industrial applications. AThe components of the LSV-100® are composed of diverse metal materials: the body and bonnet are composed of A216 WCB carbon steel or A351 CF8M alloy steel; the plug and seat are either 410 stainless steel or stellite hardfaced; the stem is either 410 stainless steel or 316 SS; the bonnet bolting and seal consist of A193 B7/A 194 2H and flexible Graphite/316 materials, respectively. These standard materials enable the control valve to perform optimally in exacting environments, but the materials can be altered to suit special application requirements. Additionally, other materials of construction can be made available via special request. The LSV-100® Control Valve features a trim that can be replaced in the field through the valve’s bonnet. The valve trim is interchangeable; the trim options can be set per end user specifications, and include reduced port, standard port, and full port options; these options will provide fast opening for on/off service, linear for superior mid-range control, and an equal percentage for ideal low range control. The trim style is top guided, single seat, and unbalanced; it is suitable for pressure drops that reach up to 600 psi in non-cavitating environments. 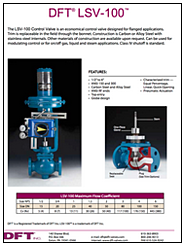 LSV-100® valves are available in line sizes ranging from ½” to 6”. These valves have a top entry, globe design and fast opening, linear or equal percent flow characteristics, helping set them apart from other control valves.